Facebook post accusing Abdullah of making the threat shared over 27,000 times. 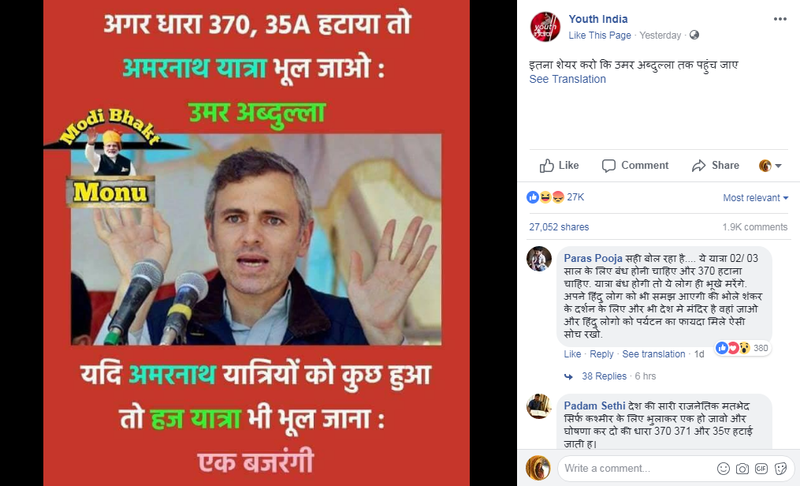 Hyderabad: Tweets and Facebook posts claiming that former Jammu and Kashmir chief minister Omar Abdullah has threatened to prevent the Amarnath Yatra from going ahead have gone viral. 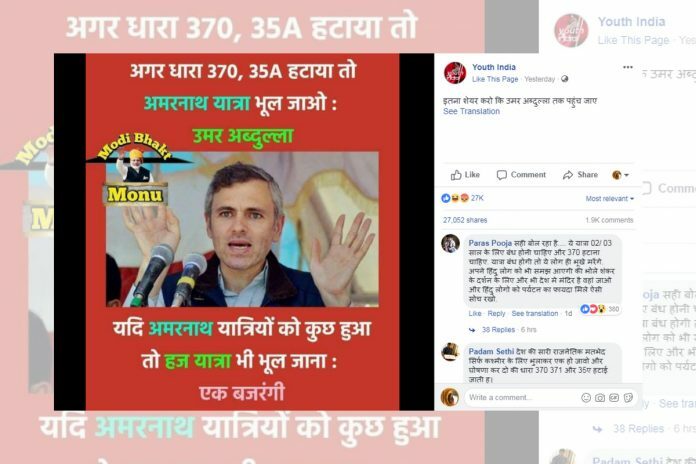 The posts accuse Abdullah of saying that if Article 370 or Article 35A is lifted in the state, then people can “forget” the Amarnath Yatra. The Facebook post, which has an image of the National Conference leader, has been shared over 27,000 times on Facebook. Similar tweets have also been retweeted and liked hundreds of times. It has also elicited responses such as this one by a “Bajrangi” — that if something were to happen to those who make the Amarnath pilgrimage, then the Hajj could also be forgotten. धारा 370 व आर्टिकल 35 A हटाया तो अमरनाथ यात्रा भूल जाएं! When contacted by SM Hoaxslayer, Abdullah said he has never said such a thing. “It’s a total lie. Show me a clip of me saying anything like what I’m being accused of saying,” he said. The Amarnath Yatra is a popular Hindu pilgrimage to the Amarnath Temple in Jammu and Kashmir. More than 6 lakh pilgrims undertake the 43 km trek during the months of July and August. Hajj is the annual pilgrimage made by Muslims to Mecca and Medina, which is to take place in August this year. Article 370 of the Constitution of India gives the state of Jammu and Kashmir autonomous status, which grants the state sovereignty and exempts it from total applicability of the Constitution of India. The state is therefore allowed to enact legislation for its own governance; central legislative powers over Jammu and Kashmir are limited. The BJP, in its 2014 manifesto, has expressed the intention to integrate Jammu and Kashmir into the Union of India. Since then, the BJP and the RSS have called for the abrogation of Article 370 multiple times. On April 3, 2018, however, the Supreme Court declared that Article 370 has acquired permanent status, and cannot be abrogated now. Similarly, Article 35A empowers the state’s legislature to define who “permanent residents” of the state are, and grant those residents special rights and privileges — especially with respect to employment, acquisition of property and the right to scholarships and other forms of government aid. Enacted in 1954, this article too was challenged in court by the Jammu & Kashmir Study Centre, a think-tank backed by the RSS. However, its legality has been upheld and is supported by the major political parties in the state, including the National Conference and the People’s Democratic Party. This article is in collaboration with SM Hoaxslayer.